Ok Sunday afternoon, the Michigan State Spartans will travel to Ann Arbor to take on the Michigan Wolverines. Michigan State comes in ranked 10th with a 22-5 record and is in 2nd place in the Big Ten. Michigan comes in ranked 7th with a 24-3 record and is in 1st place in the Big Ten. Michigan State is coming off a 71-60 win over Rutgers on Wednesday. Cassius Winston led the charge with 28 points on 8 of 17 shooting to go with 5 rebounds and a team-high 8 assists. Xavier Tillman tallied 19 points ok 7 of 12 shooting and grabbed 10 rebounds for a double-double. Kenny Goins led the team in rebounds with 12 to go with 5 points and 3 assists. Matt McQuaid chipped in 11 points and went 3 for 7 from 3-point range. Michigan is coming off a 69-60 win at Minnesota on Thursday in a game where they held the Golden Gophers to 18 points in the first half. 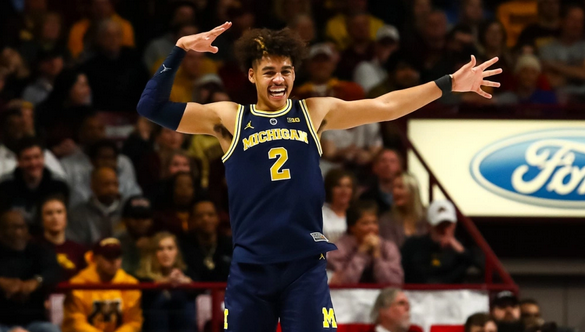 Jordan Poole led the Wolverines with 22 points on 8 of 16 shooting. Jon Teske tallied 17 points on 7 of 11 shooting to go with 7 rebounds. Zavier Simpson led the team with 12 assists to go with 5 points and 6 rebounds. Charles Matthews tallied 9 points and a team-high 9 rebounds, and freshman Ignas Brazdeikis chipped in 10 points on 4 of 9 shooting. The Michigan State Spartans are led by point guard Cassius Winston, who is averaging 18.9 points a game and is also the leading assister with 7.4 a game, which is 5 more than the next Spartan. Nick Ward adds 15.1 points a game and Joshua Langford tallies 15 a piece, but both of these guys will not play in this one. Matt McQuaid and Xavier Tillman have stepped up as they average 8.8 and 8.7 points a game, respectively. Kenny Goins is the leading rebounder with 9 boards a game. The Spartans are putting up 80.2 points a game on 48.6% shooting and are holding opponents to 65.6 a game. Michigan is led by the freshman Brazdeikis in the scoring column as he averages 14.4 points a game. He is followed by Charles Matthews and Jordan Poole, who both score 13.1 a game. Jon Teske leads the Wolverines in rebounds with 6.4 a game to go along with 9.3 points per contest. Zavier Simpson is the leading assist man on the Wolverines with 6.2 a game. Michigan has been solid on both ends of the floor this season. They are averaging 70.3 points per game but are shooting just 45% from the field. The key for Michigan is the defense as they are holding opponents to just 57.7 points a game. Michigan comes in at -4. The Wolverines have been one of the best teams in the country all year long and are almost impossible to beat at home. Michigan St has been shorthanded all year with Langford out and now are going to be without Nick Ward for some time. The absence of these two coupled with the game being at Michigan should lead to an 8+ point victory for the Wolverines. Take Michigan -4.